See this conference information in Japanese. DEAR COLLEAGUES: We are very pleased to announce the 8th International Conference "Functional Foods for Chronic Diseases". 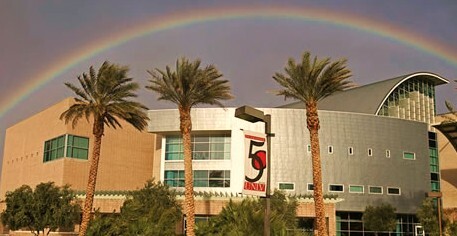 It will be held at the University of Nevada, in Las Vegas. The University of Nevada is located in the heart of the Las Vegas Valley, 5 minutes from the McCarran International Airport and the Las Vegas Strip. The conference will bring together experts in medicine, biology, and the food industry to discuss the contribution of functional foods in the prevention and management of Chronic Diseases. Development of Functional Food Products as Therapeutics. For more information about conference topics, please click here. CALL FOR ABSTRACT: The deadline for abstracts is February 1, 2011. There is no fee for submitting a conference abstract. First authors are expected to register, pay the registration fee, attend the conference and make the presentation. Abstracts must be submitted knowing that if they are accepted by the conference committee, they will be presented by the first author. However, the cost for an abstract publication fee without a conference registration is $49.00. Decisions on selection will be communicated to the authors via e-mail. All contributions will be reviewed and accepted abstracts will be published in the conference proceeding book. Authors must pay the fee after their abstract has been accepted for publication. We offer a complete or partial fee waiver for authors who do not have funds to cover the publication fees. Please submit all abstracts using the link: or by e-mail at ffc_usa@sbcglobal.net in an attached file. See our sample abstract. There is no charge for withdrawal of an abstract. If the first author cannot attend the conference and present, he or she must contact the conference organizing committee by e-mail at ffc_usa@sbcglobal.net to provide notification of withdrawal or to request a substitute presenter. Withdrawals must be received before the November 14, 2010. Please note: Abstracts withdrawn after November 14, 2010 will be published and the first author will be expected to pay the abstract publication fee. The conference provides neither financial support nor registration fee waivers for presentations. To avoid the last-minute rush, submit your abstract in advance. Abstracts reaching the Conference Organizing Committee after December 14, 2010, at 5 pm, will not be accepted. For information concerning publications, please contact us at ffc_usa@sbcglobal.net. For more information about abstract submission, please click here. INSTRUCTIONS FOR POSTER PRESENTATION: Poster presentations give the audience a clear visual of what the presenter is saying in a simple format. The reasonable size for posters is 2.5 – 3.0 feet high by 3.5 - 4.0 feet wide. The poster should clearly present the title, the author(s), affiliation(s), and a description of the research, highlighting the abstract's major elements. At least 50% of the surface area should be used for photos, graphs, diagrams. We recommend the following sections on the poster: Abstract, Introduction, Methods, Tables, Figures, Results and Conclusions. CONTINUING EDUCATION CREDITS or CEUs: The 8th International Conference on “Functional Foods for Chronic Diseases" has a maximum of 24 hours of CEU credits. Each medical specialist, dietitians and nutritionists should claim only those hours of credit that he/she actually spent in the conference. Our Continuing Education Units, or CEU's, are offered through the University of Nevada to anyone who attends the conference, provides evidence that they attended, and pays for the CEUs. This includes doctors, nurses, dietitians or nutritionists. GUIDANCE FOR AUTHORS: The best way to send your contributions is by email, as an attached file. Our preferred word-processing format is Microsoft Word, version 6 or higher. Manuscripts must be single-spaced, in 12 point font (including the references and legends of tables and figures) on sheets of uniform size (preferably ISO A4 or 8 ½ x 11”) with wide margins. A title of up to 10 words (in all capitals), and the first and last name of the author, department, and organization’s address should also appear. If there is more than one establishment involved in the work, authors' names should be linked to the appropriate establishment using numbers or the symbols *, †, ‡, §, and ¶ in that order. A summary giving a bulleted outline of content should appear for the introduction. If there are any abbreviations in your article, they should be placed in brackets after the full title on the first occasion they are used. The main body of the paper should be divided into: (a) introduction; (b) experimental, including materials and methods; (c) results, with appropriate quantification and statistical treatment of data; (d) tables and figures; (e) discussion; (f) acknowledgements, including details of financial support; (g) numbered references. It is often an advantage to combine (c), (d) and (e) to gain conciseness and clarity. The discussion section should not recapitulate the results, only discuss their implications. The number of references should not normally exceed 50, and 20–30 references are frequently adequate. REFERENCES: References in the paper must be numbered in the order in which they appear in the text. The list of references at the end of the paper should give all the authors' names and initials unless there are more than 6 authors, in which case 'et al' is used for subsequent names. This is followed by the title, abbreviated according to the "List of Journals Indexed" in Index Medicus, the year of publication, the volume number, and the first and last page numbers. References to books should give the names of any editors, place of publication, publisher and year, in place of the journal information. COPIES FOR CONTRIBUTORS: We will furnish one copy of the collective work without charge to the lead author of the article (Functional Foods for Chronic Diseases, volume 6). REGISTRATION FEES: The registration fee will cover the Conference Proceedings (Abstracts), lunch and refreshments during Conference days as well as one year of membership to the FFC. We are pleased to offer Early Bird Registration. Cancellation Policy: Two months before conference: 75% refund, 45 days before conference: 50% refund, one month before conference: No refund. Refund will be sent after the congress. Notice of cancellation of registration must be received in writing to the Conference Secretariat at ffc_usa@sbcglobal.net. To obtain the special fee for students, an approval letter signed by the head of the department, together with a copy of a valid student card must accompany the registration form (if registered via the website, please mail it to ffc_usa@sbcglobal.net). **Letter of verification required by email. Special Hotel Pricing Available: Rooms have been reserved with the Embassy Suites Hotel in Las Vegas. Rooms are available by using group code FUF and by calling either 1-800-726-1751 or by calling the hotel at 702-795-2800. Reservations for the March 15-17 for the conference special rate of US $109 + tax per night. This rate is available through February 21st, 2011. For more information about the conference, please contact us by e-mail at ffc_usa@sbcglobal.net. For international calls, please use (1)-469-441-8272. Cytotoxic Effects of Litsea Cubeba Extracts on Human Breast Cancer Cell Line MCF7. Ready to Drink Fortified Juice Resulted in Improved Iron and Zinc Status of Schoolchildren. Hypoglycemic Effect of an Extract From Date Seeds on Diabetic Rats. Natural Herbal Plant Extracts as Antioxidant and Anticancer Agents in Egypt. Commonly Consumed Fruits in the Philippines: Are They Good and Safe for Diabetics? Inhibitory Potential of Some Traditionally Consumed Fruits and Plant Materials Against Fructose Induced Glycation of Albumin. Session 5: Functional Foods in Health and Disease Session Chair: Jagat R. Kanwar, PhD. Medicinal and Nutraceutical Properties of Hot Pepper (Capsicum spp.) and Bitter Melon (Momordica charantia L.). Primary institution/Laboratory name, city, state and country. If there is more than one establishment involved in the work, authors' names should be linked to the appropriate establishment, using numbers or the symbols *, †, ‡, §, and ¶ in that order. A summary giving a bulleted outline of content should appear for the introduction. REFERENCES: References in the paper must be numbered in the order in which they appear in the text. The list of references at the end of the paper should give all the author's names and initials unless there are more than 6 authors, in which case 'et al' is used for subsequent names. This is followed by the title, abbreviated according to the "List of Journals Indexed" in Index Medicus, the year of publication, the volume number, and the first and last page numbers. References to books should give the names of any editors, place of publication, publisher and year, in place of the journal information. The deadline for article submission is December 14, 2010, at 5:00 pm. Herbs and Non-traditional plants as a source of functional food products for diabetes. Herbs and non-traditional plants as a source of functional food products for obesity. Herbs and non-traditional plants as a source of functional food products for CVD. Herbs and non-traditional plants as a source of functional food products for cancer. Functional foods for the management of metabolic syndrome.